Our range of electrical operation theater tables provide accurate positioning while ensuring patient's comfort. Made from high quality stainless steel, these tables features can withstand extreme load in every configuration. The modular design of the operating table guarantees ultimate stability with complete safety of the patients. 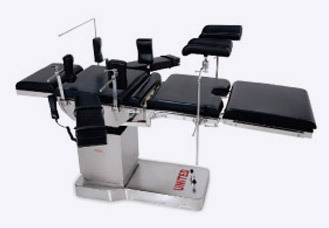 Our range of operating table are available in different models at the most competitive pricing. Modern design Electric operation Table Radio Translucent Top for use of C-Arm Image Intensifier such as general surgery and certain special surgical procedure etc. Central position table column and inter changeable head & leg section for maximum use of C-Arm Image Intensifier. Smooth and accurate positioning by Remote Control for Hi-Lo, Trendlenbueg / Reverse trendlenburg, Lateral Tilt & Head side Raising/Lowering. Base and column are covered with stainless steel sheet. Minimum height : 80+5 cm. Maximum height : 95+5 cm. Hydraulic Lift : 22 cm.